Le Stim - Tribute To Muhammad Ali (We Crown The King). Vinyl 12. Bleep. 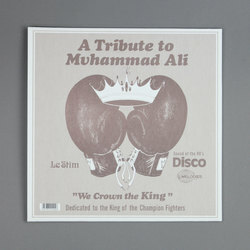 Floating Points' boutique archival imprint Melodies International presents the crowning jewel in its rich discography to date with the long-awaited reissue of the 1980 Detroit disco anthem Tribute To Muhammad Ali (We Crown The King) by Le Stim. 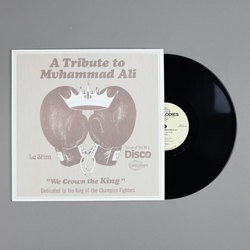 An essential addition to each and every record collection no matter what styles, sounds and genres you dig! Le Sim was a band formed by lead vocalist Donald Jennings in the late 1970s. Having been brought up in a gospel environment it was often said from a young age that he was born to sing. Having spent time performing frequently in and around Detroit as well as performances in St. Louis and New York, in the mid 70s Jennings was approached by fellow Detroit resident and musician Herbert Andrei Duncan with a song he had written titled ‘We Crown The King’. After a little persuasion, Jennings agreed to recorded vocals for the song and in 1980 they released the song that would go onto become a legendary soul classic for decades to come. Around the time of the record's release, Le Stim was in touch with Muhammad Ali’s management, who were even set to meet him on a number of occasions, but unfortunately this didn’t work out (although Jennings has said Muhammad Ali did hear the track back then and liked it)!